Here we have another pre-surgery Christmas craft! I made the biggest coiled fabric bowl I've ever made! This is a fake-action shot, but you can get a better idea of the size if you compare with that skein of yarn. As you might well know, I love to save up my scraps for weaving projects and other stuff like this, so all the colors and patterns are mixed up, but still nice and cheery bright, as I like them. It has a new home in Washington with my sister-in-law-in-law :) I hope it'll get much use as a fruit basket or notions basket, or by-the-door catchall, or something! And again, thank you all for the well wishes and get well soons!! I SO appreciate every kind word. I'm doing fine, my recovery is right on track, I believe! I'm feeling better each day, but I'll admit, I've been having some really frustrated days. I know things are getting better, but I think a lot of constant tiny irritations just get under my skin sometimes. Plus, I haven't got much of an outlet to relieve stress at the mo'. I can't wait until I can craft at 100% capacity again!!! That's what keeps me sane :) Anyhoo, happy Wednesday. Every year for Christmas, the Nichols side of my family has one other family to get presents for, and this year I was pleased to see I could craft for some of my older nieces! I thought teens/tweens can always use zippered pouches for sleepovers, makeup, girly things and whatnot, so I made these before my surgery to send off to Washington. 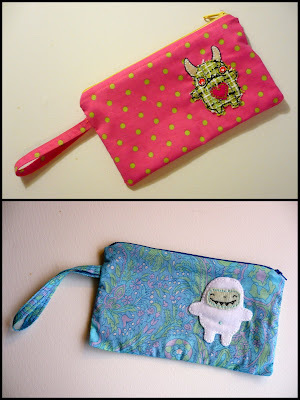 They're based off of different plush I've made that the girls each noted as thier favorite: Sad monster and plump yeti! Here's the little yeti, I appliqued him with soft fleece, and added a nose and belly button for good measure. Here's an update on the back surgery recovery front: I haven't done ANY more crafting after that deer. I had been feeling a lot of pain, a little more back pain, so I called the nurse from recovery and she said that I should NOT be sitting for more than 15-20 minutes at a time, and avoiding sitting as much as possible (she said, "Either be laying down or walking!"). So I've obeyed and am doing MUCH better pain-wise. PLUS, I walked nearly 1/2 mile today! I should be walking 2 miles in a day by 4 weeks post-surgery! It's been 10 days. But I gotta go! I'm sitting typing this, and it's killing me! Much love! Happy late Christmas! Here's my first art post surgery! I had to draw, paint and outline this little winter deer in really short increments over the last few days. My plans are to color copy it to make thank you cards for all my friends from church who have been helping me so much! Sketch. Okay, I've got to go, I'm tired as heck, gotta sleep. Merry Christmas! Happy Wednesday! Hey friends! I thought I'd post just real quick, let you know I got home from the hospital yesterday afternoon. The 2.5 hour car ride home sucked! I'm doing great, though, no more back pain, ONLY incision pain. It's really amazing, so happy. I have a big 6 or 7 inch long incision on my belly, and then 4 surprise 1 inch ones in the back. They did the anterior/posterior fusion instead of only anterior. I can walk a bit, and can only sit in a sraight chair for 30 minutes at a time. Otherwise, I'm laying down. I'm on a lot of drugs. I actually drew a reindeer yesterday, and I might be able to watercolor it tonight!!! If I can, I'll post it. Merry Christmas! Thank you all for your love and support and prayers! I'll be back in no time! A little stitchin' and I'm ready to go! Hey hey! I've been in much higher spirits the last few days, just knowing that the surgery is ALMOST here! I actually did some embroidery (hooray for crafts you can do in bed!) So, I doodled this little blue tree thing over the last couple days. Chain stitch! French knots! It was SO NICE to be able to create something, as I've been going nuts just laying here, not being able to do anything but watch netflix and browse internet memes! So, my husband is taking me in to the hospital for pre-op tests tomorrow morning, and then Thursday is the BIG DAY! I'm going to get my spine fixed! WOO HOO! :D Wish me luck, friends!!! Hey friends. I just wanted to update real quick. I've had the most horrific week, and I'm in a terrible amount of pain. I had to switch my pain medication, and have been going through very, very difficult drug withdrawals. I could hardly believe what was happening to me, considering I always, always took my medicine as directed by my doctor. Now I'm taking only a (mild by comparison) anti-inflammatory, and the pain is really really bad. My back surgery is in 8 days, so if you're inclined, I would appreciate any prayers or positive thoughts to help me get through the next week, and also that my surgery goes as well as possible. Thanks so very much. I miss crafting SOOOO much, but it's feels good to know you guys will be waiting for me when I come back, hopefully sooner than later and better than ever. Earrings! It's been a pretty long while since I've made any jewelry that wasn't resin-oriented... This is a quickie little set of earrings I made with some of the jillions of beads I have in my crafting arsenal. I've done a liiittle bit more crafting this week, but I can't share yet, since they're for Christmas presents, and I'm pretty sure the recipients read my blog. Oh well, I'll be sending soon, and it'll give me a teeny backlog of things to post in mid December when I'll be doing ZERO crafting. I've been feeling very blah and bummed lately... It's mostly because my painkillers just aren't cutting it at all. I'm wavering back and forth on calling the doctor and asking for a med change-up because I know everything will get mixed up in less than 3 weeks when I get my back surgery done. Bah, I spend probably 85% of my time in bed, and it's just getting depressing. I try to get up and eat, craft a little, run errands, etc. but most all vertical activities are followed by a pain spike and immediate regret. And I feel like a giant whiner. I don't want to be Debbie Downer, but yeah. My interaction with the outside world most days has generally been limited to my laptop. So, it's my craft blog and I'll cry if I want to. Since I don't have a lot of crafting capacity right now, I thought it would be wise to finish up the little project I needed to make for the Craftster Tiny Fairy Tale House swap. It feels nice to have the pressure off, and I'm very pleased with how this Little Mermaid-inspired house turned out! It's about 1.5"x1.5"x2", embellished all the way around with seashells and a responsible amount of glitter glue (because yes, there is such thing as too much glitter glue). The shells are sparkled up with some jaquard pigment powder... so subtle and shimmery! My favorite part is the roof! I used my cricut to cut scallops, then painted the layers in different colors of that powdered pigment before gluing them down. It reminds me of fish scales, the way it's shiny, and well, the shape! I think I've got to make a similar fish ornament later on. And what work of art is complete without a touch of sparkly microballs? Haha, I couldn't leave them out, because they look so much like little bubbles. Perfect for Little Mermaid-esque-ness. So there's just a touch. I made this postcard for Audio last week, and now it's arrived and I can share it! It's a kinda collagey type piece, using some little paper scraps and things. The falcon was cut out of a book, and the tags are punches. Something was missing at the end, so I just had to add some sparkly microballs. Happy Sunday, everyone. I hope your weekend was super! I told you I'd have a swap project to share! 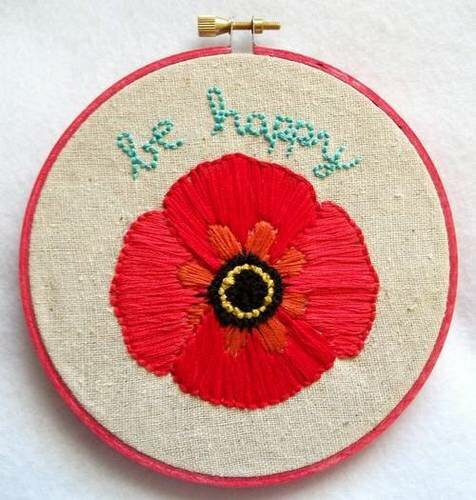 This is the hoop I embroidered for the craftster hoopla swap and sent to barbolot. With all the nutsy things happening lately, I forgot to take pictures before I sent it off (bad craft blogger! bad!). Luckily, she has superb photography skills and these pictures are hers. 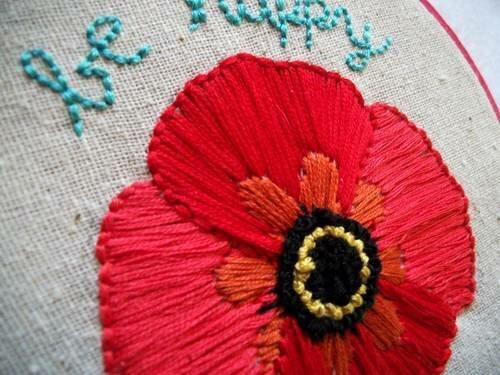 So, it's a poppy, and it tells you to be happy! I hadn't really accomplished much satin stitching before this piece, but I'm glad I got a little practice. It won't be so intimidating in the future. So t-minus 29 days until the surgery!!! (it is going to be an ALIF. Click that to see a fun little movie!) I'm going to try to accomplish as many sketchbook project pages as possible before then, because I guess that recovery is going to be a real you-know-what! Happy Wednesday! I made a ton of scrabble tile pendants for the craft fair, and here's a little group shot :) I did a lot of robots and cupcakes, because they seem to be pretty popular... At least they are my favorite. I learned a LOT... Mainly what sells and what doesn't. And that I think it pays to have colorful displays, but hey, you know me! Would I have anything but colorful? :) Oh, and I found a good final use for my halloween pumpkin. He made a great sign-holder. Here's the display board I made for my shrinky earrings and scrabble tile pendants. It was my cricut to the rescue to make a lot of my display signs. *Huge sigh of relief! * So it's all over! After a week of crazy crafting and ouch, I'd say it was worth it. I had a lot of fun, and I'll do it again (especially now I've got all the displays made)! And hopefully after I get my back fixed, because it's KILLING ME. Tomorrow's the day I get to see the spinal surgeon... Wish me luck. Blog Hiatus - UPDATE: Umm, just kidding. Well, it looks like I spoke too soon... I just found out yesterday that I have the opportunity to do another craft fair a week from today. I couldn't turn it down, so it looks like I'm going to have to craft like a mad woman, so back pain be darned this week. This is going to be tough, but with Christmas coming up, I can't pass up the little bit of extra income. Anyway, I guess I won't be disappearing after all. Hey friends! As you have probably read before, my back issues have been especially oppressive lately. So I'm taking a break from my craft blog... I hope this doesn't sound nuts, but I love connecting with all you guys who read, and feel like I'm disappointing somebody, somewhere in the world when I don't have anything to share, especially after going for so long, posting a new project just about every day. Do any of you other bloggers feel any sort of imaginary obligation to blog? Even though you just do it because you love it? I dunno, maybe I'm just silly. You understand, right? I've got an appointment with that spinal surgeon in less than two weeks, so hopefully he'll be willing to rescue me somehow. After 7 years of dealing with progressively worse pain, I've just GOT to have something done. I'll probably still keep posting on my personal blog, so if you care for an update on that front, head over. Anyway, thank you guys so much for all of your kind words and support. I love you! I made this hat a little while ago, and didn't have a use for it, but hey! It was the perfect size for the pumpkin. I tied on some scraps and ribbon and novelty yarn, and some colorful feathers for good measure. I hope everyone has a happy happy halloween this year! Oh! And thanks for all the love, to you guys who have been leaving such sweet comments. One of Bobby's friends from work told him about an excellent sports injury/orthopedic office where he got disc replacement surgery. He was really happy with the doctors and all, so hopefully I can get an appointment soon to see if there's some sort of procedure that can help me out... And a doctor that won't tell me I'm "too young" for surgery! I'll keep you posted. I've barely made ANYTHING! My back has been a real problem lately, so I haven't been very inspired. Or maybe it's just that I can't really sit and focus on making stuff. But anyway, one thing I've completed is cutting squares for that big ol quilt I'm planning. So with that, I've ended up with a lot of little scraps! Real quick, I snipped up some triangles and made this itty bitty bunting garland. It goes nicely hanging just below my bulletin board on my semi-messy workspace. Look how tiny it is. Hooray for it. Also, since I've been a bad blogger lately, I've got a couple of sketchbook pages together that I'm not 100% satisfied with. I finished these last week. This blue page is a mess of strings and a sleepy cat. The idea was that she was dreaming of yarn... Not sure it's effective. I just realized that I haven't blogged this little card I made to go with the pumpin man hanging decoration! Trying to model the same guy, I made this out of various papers and things. My cricut came in handy for the lettering. I ran out of black buttons, so I just painted some white ones with black acrylic ink. I've been pretty darn busy lately! Not enough time to craft the little things. I started cutting squares from all the scrap fabric to make a quilt. I'm shooting for ambitious and making a queen size. Wish me luck! I'm about halfway done with cutting squares... I have no idea how I'm going to quilt the thing, though! If any of you reading this are avid quilters and have one of those big machines that quilt really fast, I just might be interested in swapping services for crafts :) Well, happy Sunday! I hope you had a great weekend. Here's the set! The farting cat is a little crude, but I thought it was funny since the cat has such a cute face. I might toss this little book in my Etsy shop later, but I've been so bad at stocking it over the last month. In other news, I ordered a 36 color Pearl Ex powdered pigments set and it's going to get here TODAY! I'm so psyched, there's so much you can do with it. 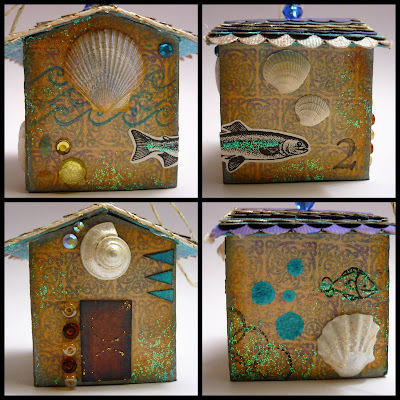 Mix it with paint, poly clay, embossing powder... I'm soooo excited to play with it. I bought it via Amazon with my swagbucks earnings... So it was free! Anyway, you'll be seeing some projects with some sweet pearl ex soon. Happy Thursday!